Stryker infantry carrier vehicles from 3rd platoon, Company C., 5th Battalion, 20th Infantry Regiment, 3rd Brigade., 2nd Infantry Division (Stryker Brigade Combat Team) landed at Osan Air Base, Republic of Korea, July 31 aboard C-17 Globemasters from McChord Air Force Base, Wash. 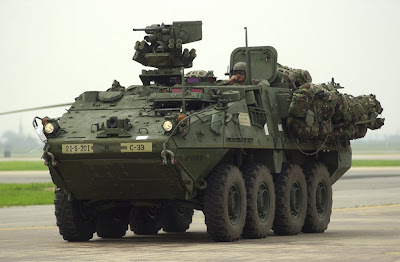 This marks the first overseas movement of a Stryker unit and demonstrates the long-range, rapid-movement capabilities of the SBCT. A total of six Strykers from Fort Lewis, Wash., will participate in a live fire and Stryker capabilities demonstration next week at the Rodriguez Range Complex in North Kyungki Province. This training continues to demonstrate the commitment to the ROK/US alliance and the ability to rapidly reinforce the Peninsula as needed. After a week of training, the Stryker unit will return to Fort Lewis.